Where Were You On February 28, 2010? [twitter]On February 24. 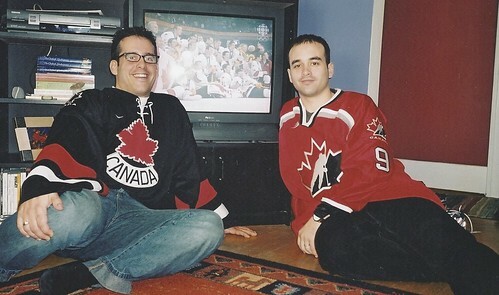 2002 I was in my brother’s Vancouver living room watching Canada manhandle the USA to their first gold medal hockey win in decades. As the team gathered for a photo on the ice, my brother and I squeezed in alongside. It doesn’t matter where I was in February 2006, because I wasn’t watching Canada play for a gold medal at the Torino Olympics. On February 28, 2010 I was at the Rusty Cage on Heritage Drive in Calgary with my pal Roger watching Canada and USA in the gold medal hockey game of the Olympics. Chances are you were too, as more than 80% of the country tuned in to watch the tilt. The Super Bowl and The Oscars and Seinfeld may have more viewers, but when it comes to market penetration, there’s nothing on the planet that will make 80% of a country’s population stop like gold medal hockey does in Canada. Where were *you* on February 28, 2010?